Panels are made up of respondents who answer your surveys. 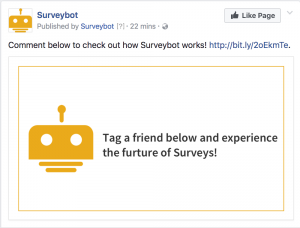 Each Facebook page that you use for your surveys will have it’s own panel. You can segment your panels based on your own conditions. Currently Surveybot enables you to segment based on respondents that have completed or not completed surveys. 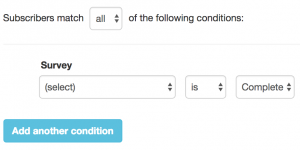 We’re adding more conditions to segment by but if you need a new condition please contact us. Campaigns enable you to distribute your surveys over Facebook. There are 3 types of campagins which are Facebook Posts, Facebook Ads and Surveybot Panels. The Facebook Post campaign enables you to promote your Survey as a Facebook post on your Facebook pages. 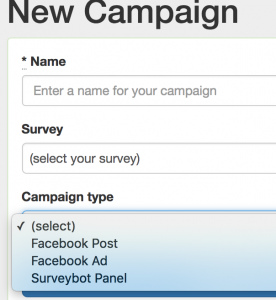 You can also link existing Facebook posts to your campaigns if you want to create posts outside of Surveybot. 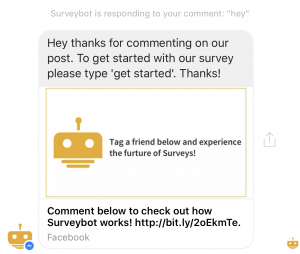 This is a cool feature with Facebook post campaigns where you can automatically start a Messenger conversation with your Survey whenever someone comments on your post. Try out our example post here. This is the most powerful way to promote your survey. 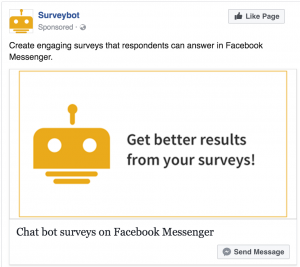 In Surveybot you can design the message to be sent to people when they click on your ad. 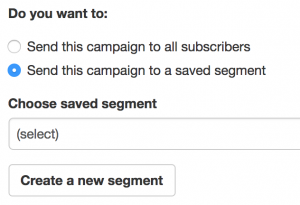 Then create your ad in Facebook and link it to your Surveybot campaign. 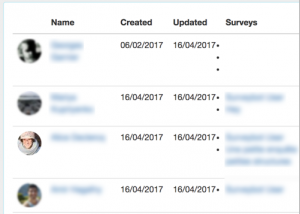 Once you’ve built up your panels in Surveybot you can send surveys directly to your respondents over Messenger using Panel campaigns. You can also send your surveys to specific panel segments. This can be handy for things like incomplete surveys. Track the performance of your campaigns based on your survey response completion rates. See which campaigns are performing best for your surveys!